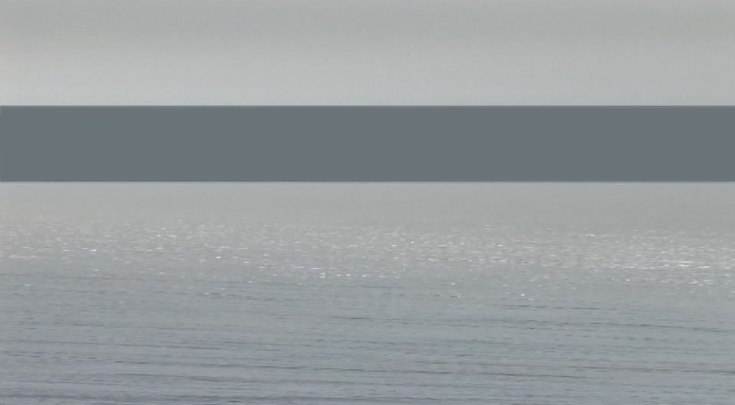 In Sea (2011) images of the horizon form linear bands of colour through the spatial and temporal composition of scan lines. The video is composed of multiple instances of the same recordings. These have been layered and masked in different configurations with areas one pixel in height, each offset by varying iterations of 1/25th of a second from the next. These layers are duplicated, inversed and reversed such that the images develop through one another, with the textures a series of colour fields. Monochrome blocks of colour sampled from the recordings foreground and flatten depths. Separate planes and temporal reorganisation bring the movements into relations with colour and form.